Contents and Media: Hardcover with colour sleeve, 152 pages, colour , black and white pics. Advantages: Excellent information, history and reference on the A-4 Skyhawk during its service from acquisition to disbandment with the Royal New Zealand Airforce. Recently I had the pleasure to receive a copy of the above book from a HyperScale friend in New Zealand. I've been a fan of the A-4 Skyhawk for quite a while and after the release in 1/48 scale by Hasegawa of the A-4K version of the 'Scooter', I was looking around for a good reference source to help build the RNZAF version of this venerable aircraft to go with my excellent Gekko Graphics decals I had just purchased. After asking around for any sources on the A-4 with the RNZAF, this book was suggested by a number of 'HyperScalers' and after taking delivery of my copy, I've found that it fits the bill perfectly. 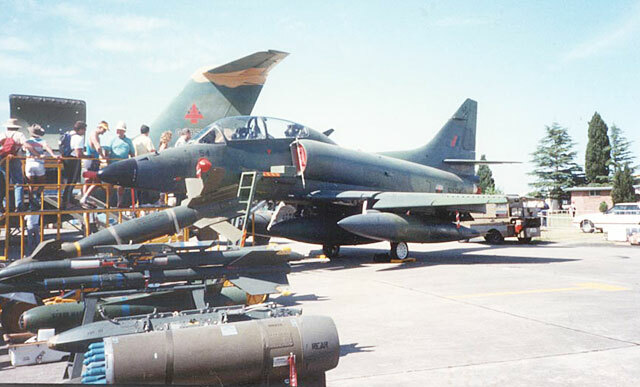 The book comes in a hardcover format with a full colour sleeve showing an excellent front-on view of a RNZAF A-4 in all its glory, 'bombed up' and ready to go to work. Covered in the books glossy 152 pages and 13 chapters, is everything from a history of air combat from WW2 with the RNZAF aircrew in the RAF, selection of the A-4 Skyhawk in the 1970s to replace the ageing Vampire fighters and Canberra bombers then in service with the RNZAF, flying the A-4, attrition, aerobatic teams including 'Kiwi Red', refurbishment and the 'Kahu' update, acquisition of the Royal Australian Navy A-4G and TA-4G aircraft through to 1990s Defence politics, deployment of 2 Squadron RNZAF to Nowra, NSW in Australia, replacement questions and the final political decision of disbandment. Inside the front cover is a brief specifications table of the A-4K with a rough line drawing of the same and at the rear of the book are comprehensive appendices covering things such as a pilot list, Commanding officers of 75 Squadron, RNZAF, and aircraft serials and losses during its service. 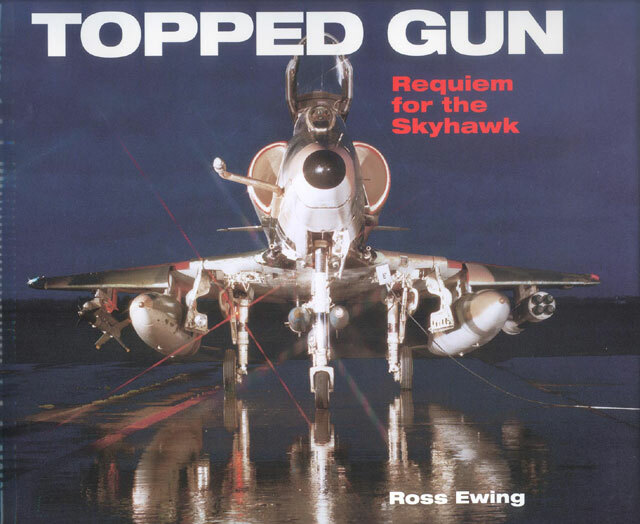 I found the book to be a perfect partner to the video 'A-4 Skyhawk' that celebrated 25 years of Skyhawk Operations by the RNZAF that was produced in 1995 by Demand Video Productions Ltd. The author of this book was on the team from the RNZAF that trained and then took delivery of the aircraft in the US and discusses the A-4 and its purchase in the video. I believe this video is still available through Aviation Worldwide in NZ. Check out their website at www.aviation-worldwide.com for availability. I have purchased a number of items through them and the service is top rate. I found the book to be a comfortable, enthralling and easy read. It is well illustrated in both colour and black and white, and deals with the subject in most chapters in a non technical fashion. The final chapter is of special interest as it discusses the political decision to disband the RNZAF fast jet capability with the ultimate demise of the Skyhawk squadrons and the Macchi MB-339 training aircraft, and what is at stake to the New Zealand people because of this decision. If you are after a technical manual this isn't the book for you, but if you are interested in the A-4 Skyhawk in general as well as their service history with the RNZAF this book will make a welcome addition to everyones reference library. The book is available direct from Old Sausage Publishers Ltd, P.O. Box 20-170, Christchurch, New Zealand. 2002 for NZD 49-95 plus postage and packing. For information on ordering and payment requirements you can contact them at orders@oldsausage.co.nz . Some enquiries I made to the publishers on some areas of the book were met with a quick and courteous reply so you can be assured of prompt service. This is a great publication, an enjoyable read and well worth the purchase price for anyone interested in the A-4 Skyhawk. Many thanks to the publisher for his assistance with the book and answering my emails.